When Will The Browns Cut Johnny Manziel? The Cleveland Browns are completely done with Johnny Manziel; Hue Jackson’s comments at the combine are as close to confirmation as anyone needs. But while every other team was cutting their dead weight last week, the Browns aren’t going to do anything until 4 p.m. EST today at the earliest—and possibly not for a while after that. The Browns haven’t cut Manziel yet because they can’t afford to. 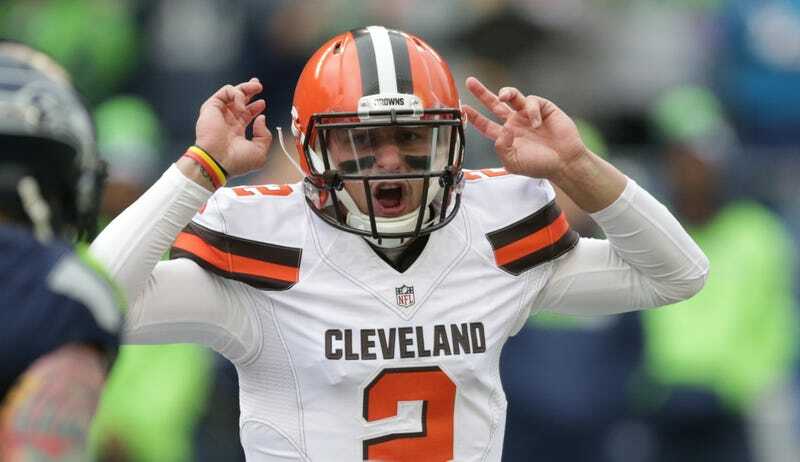 They’re right up against the salary cap for the 2015 season, and cutting Manziel midway through his rookie deal would require them to pay out all his remaining guaranteed money and take a $4.3 million cap hit. They simply can’t fit that under the 2015 cap, but if they wait until the new league year, which begins this afternoon, the cap hit will count against their 2016 payroll, when they’ll be able to absorb it. There remains the slight possibility that Manziel may remain a Brown for months to come, for two reasons, both money-related. The first is pragmatic: if Cleveland waits until June 1, they could spread Manziel’s dead money over the next two seasons. The second reason is pragmatic too, but kind of depressing: if Johnny Manziel is a member of the Browns when the NFL hands down a personal-conduct suspension for his domestic violence incidents, the Browns stand to recoup some of his guaranteed money. So the ideal situation for the Browns is to hold on to Johnny Manziel until he’s suspended, and then cut him. The NFL is a magical place. Contact the author at barryp@deadspin.com.